IFA was September 3 and a host of new goodies were announced. Many manufacturers use this yearly trade show, hosted in Berlin, as a launching point for new products that will be available for the holiday season. Sure, Apple is set to announce the iPhone 6 and their first wearable device on September 9, but with so many leaks and the media coverage they’re already old news for some people. This year’s IFA announcements contained a hefty line-up. So without further adieu, let’s get cracking! Don’t miss this latest episode of the JustUs Geeks Podcast! Samsung announced two new smartphones, Galaxy Note 4 and Galaxy Note Edge, and a virtual reality(VR) headset designed in conjunction with Oculus (which we have mentioned in a previous article). First let’s cover the new phones, then we will jump quickly into the headset. The two new phones announced are updates to the Note series and will share some very impressive features. The new Note 4 will have a 5.7-inch Super AMOLED display, which is getting a quality bump from 1080p resolution to Quad HD (2,560 x 1,440) on the same size screen as the current Note 3. I think this was a good move because bigger is not always better. Sometimes it’s better to place focus on the quality of a product and not its size. The rear-facing camera sports 13.7 megapixels and the front-facing camera will be 3.7 megapixels. The front-facing camera has a few bells and whistles aimed squarely at “selfieaholics” (yes, I just made that word up), such as a “wide angle” feature (think panoramic selfies) and a preset aperture for taking better low-light selfies. When available here in the states, both new phones will have a 2.7GHz quad-core Snapdragon 805 with a 600MHz Adreno 420 GPU. This should make it one of the most powerful on the market and make playing video games and streaming videos a breeze. Both devices will also get an improved fingerprint scanner, compared to the Galaxy s5, that will support authentication with Paypal and Google Wallet. What sets the Note Edge apart from the Note 4 is that the display curves around the device on the right side, allowing you a place to store the icons of your most used apps. Because of this alteration, the screen size is just ever so slightly smaller, coming in at 5.6 inches. It looks simply amazing. How practical will it be? My money is on not very. How soon will it be the first thing broken or damaged? My guess is it will be the first thing to go. Hence, it gets my vote for the least practical thing in a long time, but it is still pretty spiffy. No prices were announced for either product, but speculation is that they will be priced roughly in the $700 range. Samsung has joined up with the Oculus team to design the Samsung Gear that you can slide your new Note 4 into and enjoy all sorts of VR goodness from across the internet for around $200. The Samsung Gear, which supports only the Note 4, has an adjustable lens and built-in sensors that detect head movement, instead of using the phone’s built-in accelerometers. What started out as an experiment between the two companies might just lead to something really cool down the road: viable and affordable VR. At first, I was ready to just throw the idea away because for $150 more you can get the full Rift DK2 package. If you’re savvy enough to actually get your games to work with it, you’re set. Google Cardboard and others like it are out there and allow you to use just about any phone, but modern smartphones have really crappy accelerometers in them. They all do! And this makes these devices, although affordable, not very useful after more than 15 minutes. Samsung Gear may just be onto something here. We will have to wait and see. Sony announced three new devices, all of which are waterproof, to their Xperia Z3 line: 5.2 and 4.6-inch (Compact) smartphones, as well as an 8-inch Tablet Compact. All three are expected this fall and just in time for the holidays. T-Mobile will be carrying the line-up, so go check them out. Not letting the wearables trend pass them by, Sony also announced an update which adds a small screen to the SmartBand fitness device, and the SmartWatch 3 will now include GPS. Just adding a screen or GPS already puts them behind so they still have some work to do, but it’s worthy competition in an already somewhat crowded Android market. Asus showed off their ZenWatch, which is pretty unique in that you pair it with another Android device, instead of it being self-reliant. I must say it is probably one of the better-looking pieces that I have seen. Acer announced a plethora of different devices at this year’s event, including notebooks, a phone, and new tablets. Liquid Jade is a new Android-based phone by Acer that will probably never make it to American shores, but it’s worth mentioning anyway. Touted as the most compact 5-inch phone on the market, it comes in at a speculated 4.23 ounces and a thickness ranging from 0.27″ to 0.03″. We can just call it thin! It also comes paired with a wearable, named the Liquid Leap, which only works with the Liquid Jade. The phone’s specs are amazing for its size. Although the marketing of the two devices seems a bit flawed, let’s hope this experiment bears fruit for future devices. Acer also announced two new tablets that will be available here in the states, and each deserves a mention. Top that off with the fact that each should be priced within reach of just about any enthusiast and it all sounds like great news. The first of these is the Iconia Tab 8 W, running Windows 8.1. It comes with a host of Office productivity tools (Excel, Word, Outlook, OneNote) out of the box. It has an 8-inch display, running on an Intel Atom Z3735G quad-core processor. At this time, not much more is known about the device other than it will be priced around $149.99 and available in November. The next is the Iconia Tab 10, running Android KitKat 4.4 on a MediaTek quad-core processor. All of this is covered in a 10.1-inch display of Corning Gorilla Glass and priced at $199. Either one sounds really good to me. Lenovo announced several new systems at this year’s show and a few are quite the surprise. Their new Ultrabook looks really nice, plus they released an affordable gaming PC. Of all the items released, these were the ones that caught my eye. So let’s see why. The ThinkPad Helix 2-in-1 Ultrabook is not a new item, but it does get a well-deserved update to the Helix introduced last year. The new Helix is 12% lighter at 1.8 lbs and 15% thinner at 0.38 inches thick. Processors are being upgraded to Intel Core M (which we will talk more about in a moment), from the Ivy Bridge options available in the older models. This 2-in-1 can operate in five different modes: tablet, stand, tent, laptop, and desktop. The display comes in at 11.6” and is 1920×1080, and it’s topped with Corning Gorilla Glass. If you have been looking at getting a new laptop and are considering an Ultrabook, the fact that the Helix will be starting at $999 makes it a viable option. The inclusion of the Intel Core M alone makes this 2-in-1 a win win! A Little More Meat for Your Money? If you’re the type that needs a little more meat on the bone for the money, you might very well be impressed by the Lenovo Edge 15. Coming in at 5 pounds and just under an inch thick, this puppy is no Ultrabook by any strech. But we want more power, not a flatter device. The Edge 15 can be configured with up to a Haswell Core i7 CPU, 16 GB DDR3L, optional NVIDIA GeForce GT840M graphics, and either a 1 TB hybrid drive with 16 GB of Flash or a 256 GB SSD. Now that’s more like it! The 15/6″ display can be folded back and supports 10 point multi-touch. Starting at $899, what else can you say besides pass me a napkin? Also announced were the HORIZON 2s and 2e, which are tabletop computers: designed to be laid flat on a table or upright using an optional stand, which acts as a charging station. The 2s (“s” stands for slim) is 10 pounds lighter than the 2e, with a 27″ display running at 1920×1080. The 2e comes in with a 21.5″ display at the same 1920×1080. Both models are powered by Haswell Core processors, so they are plenty powerful and have a battery life of 2.5 hours for the 2s and 3 hours for the 2e. Prices start at $749 for the HORIZON 2e and $949 for the larger HORIZON 2s. Lenovo is not usually known for gaming PCs, but they nonetheless have some nice offerings. The ERAZER X315, which does not have a single curve on the whole chassis, comes in two flavors: A8 and A10. The starting price is set at $599. At that price, they are surely worth a look. The Intel Core M processors were specifically designed to deliver superior power in ultrathin devices where a cooling fan is not possible. The 14nm design should deliver 50% more processing power when compared to a third generation i5 processor. Normally the price of all of that power is battery drain, but not with the Core M. When compared to a 4th generation Intel Core processor, the new chip can provide double the battery life since it basically sips power while running at a mere 4.5 watts. Just about all manufacturers will be using this new chip when it is released in October. It will be available up to 2.6 Ghz and in two different power ranges, so there should be a solution for just about everyone. I did not discuss everything announced at IFA Berlin this year. Because there was so much to cover, I just mainly hit the high points. There were lots of phones, great technology, promising improvements and loads of innovations. Android-based wearables carried the most announcements. Just about every phone manufacturer released a new line or updated a currently available wearable device, and they are clearly banking on wearables being part of any tech savvy person’s future. Apple fanboys will surely not be left out in the digital cold, so I will try to cover the Apple announcement when they reveal their iWatch and payment system to go with it. Right after that, Google has a launch planned for September 15 and I will be on top of that as well. So stay tuned! 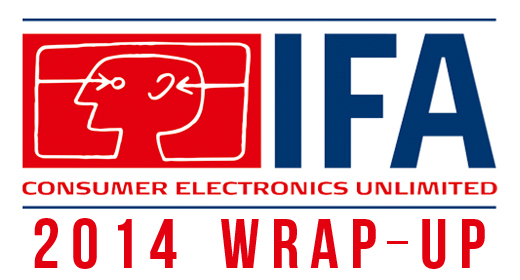 My wrap-up of #IFA2014 is out on #justusgeeks http://t.co/sRaAZj4K2z This is not everything, but closen Keep an eye on #Sept9 and #sept15. Thinking of taking the android plunge soon. I dove off that bridge a long long time ago… LOL! It’s all about eco-systems and since I do so much web development stuff, I have totally bought into Googles. So, for me, Android just makes more sense. I used to compare choosing a phone OS to Star Wars, but that is not so much the case today. It’s not like there can be a third force ya know.